The portal is a fully customizable page where you can add many widgets. For example place counters, affiliate links, forum information or whatever else you need. The portal can basically be considered as a welcome and promotion page - an appealing portal can attract many new members for your forum. Once the portal is installed, you will find here the portal configuration from now on. Here you can organize your portals. Create new, duplicate already existing or delete portals. As only the currently active portal will be displayed on your forum, you can use this feature to develop and preview alternate portals that you can make the active one with just one click. By clicking on "Structure", you can organize the content of this portal page, as explained in the next step of this tutorial. 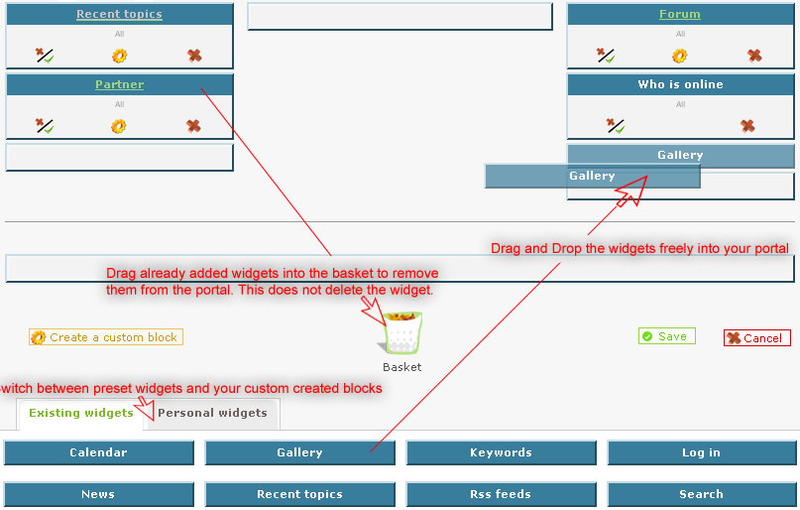 Your portal is composed of single widgets or blocks that you can freely arrange. The picture below shows the basic structure: Header, 3 columns and a footer. Placing the widgets is pretty easy and intuitive - drag and drop the modules where you want them to appear. Alternatively, you can scroll down and add widgets through the dropdown menu. Added modules can be removed by clicking the red cross or by dragging them into the basket. This does, however, not delete the widget. To delete a widget entirely, scroll down to "Addition/deletion of personal widgets" and select the widget you want to delete in the dropdown list. Click the delete link. Clickin on of a widget, allows you to modify additional, widget-related options. For example how fast or if at all the last topics widget should scroll. Custom blocks and some default ones will have the option to change it's html content there. By clicking on , you can define who is allowed to view that widget on the portal, you can choose from "Guest", "Member", "Moderator" and "Admin". In the "Structure" page (Modules >> Portal Management >> Structure), you will find a link "create a custom block" right to the left hand side of the basket-icon. Click and fill out the fields on the next page. "Use as table type" gives the widget a slightly different look - with a header that shows the widget title. Setting this option to NO, creates the widget without any borders or titles. The content goes into "widget source" field - HTML code can be used as well. Once you have saved, you should return to the structures page where you should find your newly created widget in the "Personal Widgets" tab. This tutorial was written by Sunny_D.